David Foster Wallace‘s essay “Federer as religious experience” is several years old now. I did plan to read it a couple of years ago when I first came across it but, somehow, I didn’t. However, this week, Lisa at ANZLitLovers reviewed a David Foster Wallace essay collection which includes this essay*. She decided not to read it because tennis “is just running around on a court hitting a ball with a racquet”. I suggested in my comments that there’s some congruence, affinity perhaps, between sports and the arts in that sport is (can be) about drama, beauty and character. She dared me to review the essay on my blog, so here I am! Never let it be said I’m a wuss! Unlike Lisa, I have read David Foster Wallace. Hmm, I’m cheating a little when I say this – something Roger Federer, the god of modern tennis, would be above I’m sure – because I’ve only read one short story, “All that”, which I reviewed two years ago. A couple of commenters on that post suggested that Wallace’s essays and magazine articles are a good place to start. I enjoy essays, so liked the sound of that. Beauty is not the goal of competitive sports, but high-level sports are a prime venue for the expression of human beauty. The relation is roughly that of courage to war. Beauty is not, really, the goal of literature either, but those of us who love reading love it best when the writing is “beautiful”. That beauty can take many forms, but we all know it when we see it – not, of course, that we all agree, but that’s partly the fun and challenge of it all. I’d say that Wallace’s writing in this essay is beautiful. It’s there in the way his language slides between the formal, the journalistic and the colloquial; in the way he slips in appropriate classical, literary and pop culture allusions expecting us to get them all even though he’s writing about something as pedestrian (!) as sport. It’s there in the touches of satire, the slices of tongue-in-cheek wit, and the sly digs at some of the hallowed aspects of the sport. (“Wimbledon is strange”, he writes. “Verily it is the game’s Mecca, the cathedral of tennis; but it would be easier to sustain the appropriate level of on-site veneration if the tournament weren’t so intent on reminding you over and over that it’s the cathedral of tennis”.) And it’s also there in the essay’s very structure and its shifts in tone. Despite all this beauty, though, I did get a little lost in the blow-by-blow description of an actual point played between Roger Federer and the hunky Rafael Nadal. Wallace is clearly a connoisseur of tennis. To my mind, the best essays are deeply personal (that doesn’t necessarily mean autobiographical) and deeply engaged with issues and ideas. And the best essays show that the name of the genre is also a verb, so they demonstrate a mind in process–reflecting, trying-out, essaying. Wallace’s essay embodies all of these. Wallace clearly loves the sport and knows his stuff. Not only can he identify all the tennis strokes, from cross-court backhands to forehands with topspins, but he knows the history of the game and has his own views on who was the progenitor of the power-baseline game. I particularly enjoyed his analysis of the game’s trajectory in the modern era and his assessment of Federer’s impact on it. There is also a sense, as Atwan likes, of his working out as he goes along what makes Federer Federer. I would, though, add to Atwan’s definition, that the best essays have to be interesting (durr) and, I think, they need to surprise the reader with some new angles or fresh ways of seeing. Wallace does this too. He doesn’t knock Federer-worship – in fact he’s a worshipper himself – but he explores Federer from what he calls metaphysical and technical points of view. And he entertains us while doing so. That to me is a good essay. * The essay is apparently retitled “Federer Both Flesh and Not” in this collection. Ah, but that’s just a para or two out of an interesting essay … with your speed-reading you could traverse it in a blink! Actually, I was interested in his comments on Wimbledon because for some reason this year, as I was watching the Australian Open, I became acutely aware of national differences. It seems – and I may have got this wrong so would love any experts reading to correct me if that’s the case – that players (generalising of course) love playing the Australian Open. Wimbledon might be the Mecca (and good for it – we all love history and Wimbledon is tennis history) but the Australian Open has a sense of fun. We also saw that fun at the Hopman Cup in Perth. The play is still serious and at times the fun needs to be reined in a little, but it is clearly something that is fostered here – formally and informally. And that seems, to me, to be particularly Australian. Sorry Lisa … looks like it’s me ‘n the boys! Thanks John. I’m sorry, too. Tony, because sport (unless you’re playing it yourself) is entertainment, and I think that between-the-lines you’re suggesting that there’s a moral or intellectual failing in my disinterest in that form of entertainment. I don’t agree that I must invest time in looking for the ‘beauty’ of sport before being disinterested in it – because then I would have to concede that watching a trailer of Terminator 2 or reading the hype about Fifty Shades is not enough to justify being disinterested in that. After all, being disinterested in something is fairly harmless, I’d have thought. However, as it happens, I am not ‘unread’ in sport; it is not a case of me being unprepared to look for some kind of meaning or purpose in it. It is more a matter of having invested a good bit of my time trying to fathom the reasons why in the 20th and 21st century corporate sport has become a new and unassailable religion that we are expected to treat with the same reverence. Some of the sport I have watched has been at the very highest level – live, at the venue, with the so-called atmosphere – and still it failed to interest me. I have, you see, sat through a VFL Grand Final at the MCG and a 1972 test match (yes, the Garfield Sobers 250+ runs one). I have watched swimming races starring the Ex husband who was then the fastest butterflier in Australia, and 6th fastest in the world. I could not escape when the Ex-husband watched the Pat Rafter final on TV either. (I used to go out for the day when the Bathurst 500 was on). I have also watched The Offspring & the Ex-husband play representative rugby (and done the Good Fundraising Mother Routine). I have watched the Offspring play ice-hockey, I’ve watched him complete in cycle races at the Blackburn Velodrome, and twice I was his support crew for the Melbourne to Warrnambool. Believe it or not I have even watched car races at Phillip Island, Sandown and Calder AND I have navigated in car rallies (real ones, not treasure hunt ones). All of this was done solely to please my loved ones, because none of it ever interested me. Not a jot. So – if I did accept your premise (which I don’t) – my ‘runs on the board’ would entitle me to knock sport just as much as anyone who’s read War and Peace is entitled to knock it if they don’t like it. So because you, even after the experiences you’ve given, are unable to find the beauty in sport, that means that it isn’t there? And anyone is free to knock ‘War and Peace’, that’s true. It doesn’t mean they’re right to. I fail to see the beauty in (and the point of) many types of art, but I know that this is my failing and not that of the subject. Ah Lisa, you haven’t watched the right tennis! They’re the ones that make the news. They are the minority … I’m not trying to get you to watch tennis, btw, but I have to answer that comment! I saw very little bad temper in the tennis I saw this January, for example. However, like most things, if you only see them on the news or read the newspaper headlines, you’re bound to see the worst. I’m interested in your comments about kids and sports. I loved taking my son to cricket – and became the team’s scorer. I loved it because I loved watching the boys learn about life and themselves. (I never did learn much about the different techniques of, say batting, or how to recognise one sort of bowling from another except I could tell the difference between overarm and underarm!). I loved seeing their enthusiasm as they’d go out to bat and say “I’m going to hit a 6” and get out on the second ball, but come back next week, just as keen and enthusiastic. They were great and I loved them to bits. That’s a small example of what I mean about sport and character, about seeing character develop through sport. Again, I’m not trying to change your mind about liking sport, but I don’t think sport should be discounted. As I said on your post, we can argue about things like the unequal economics of sport, the uneven reporting of sport versus other aspects of life – but sport does have a place in a rounded society I think. Very much enjoyed your review, Sue. As you know, I personally discovered Foster Wallace in the 80’s (big smile–although I was reading him long before anyone I knew was), and agree that beauty is to be found, fortunately for all of us, in many places. Enigmatic as it is, I do like Keats’ claim that truth is beauty, and beauty, truth. I came to DFW by way of his first collection of short stories, Girl With Curious Hair, then read his novel Broom of the System, and found his essays in Harper’s, notably “Tennis, Tornadoes, and Trigonometry.” I’m not a big fan of any of those three, but Wallace’s writing IS beautiful. Watching human beings perform their sport to perfection IS beautiful, although I don’t like American football much. Nicely done. Oh, whoopee doo, thanks for commenting Cate! And thanks for your thoughts and compliment. I like Keats too … interesting to ponder as you suggest. Must say, I don’t see much beauty in football in general … but will allow that others might. The eye of the beholder and all that! I’m not keen on sports which involve “attacking” people physically to achieve a goal. At least soccer (which I know you love and which I would see as beautiful, I think, if I followed it!) is about getting the ball and not pulling the people down to get the ball! I really enjoyed this post, WG. And what a photo to illustrate it! He looks like a ballet dancer. I won’t, I promise, Hannah, but I can’t promise he won’t read these comments! HI DAD I LOVE YOU HAPPY BIRTHDAY! I’ll tell him … he has now read the article and found it intriguing I think. Wow what an essay! So much to savour, review, recall. I’m an old school tennis follower and once almost interviewed Ivan Lendl for a Sydney newspaper. 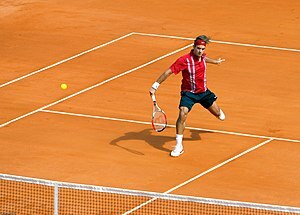 Federer is a god and of course there is beauty in sport – I can’t help thinking of the orange and black Greek vases of sportsmen (much loved by my gay friends!) which I absolutely adore and collect (postcards from museums). Thanks for highlighting this piece which is so full of passion and life and expertise. Am saving it for my tennis-freak oldest son. Oh, I’m glad you like it Catherine … It’s an interesting and intelligent essay isn’t it? Interviewing Lendl would have been interesting … He seems a very serious chap! I enjoyed your review. I like tennis even though I don’t watch it much. I like playing it too. It’s one of the few sports that you don’t have to be really good at in order to enjoy. I can’t say I’ve actually read anything by DFW other than a few short pieces (graduation address, some book reviews) but I do intend to dive in one of these days. I think part of the trouble with Wimbledon is how steeped in tradition it is and to step outside those carefully and deeply defined lines makes such a scandal. Thanks Stefanie … I guess to some degree that can be England for you, particularly regarding its grand institutions though their comedians are good at sending themselves up. Wonderful study in contrasts that place!